Music is an important part of the worship experience at the East Woodstock Congregational Church. Our Director of Music, Kristen Wedegis, leads the choirs (details below) throughout the program year (September-June), which includes special services. We are blessed to have many talented musicians who volunteer their time to participate, learn and share their talents with the congregation weekly. Careful preparation and weekly rehearsals by these musicians enables the ensembles to present music of the highest quality. The Adult Choir is a four-part ensemble (Soprano, Alto, Tenor, Bass) that sings choral pieces during Sunday and special services to enhance worship. This ensemble sings a wide variety of choral music from the sixteenth century to present. The Adult Choir is a light-hearted group with different levels of singing ability. The members of the choir enjoy coming together to sing and enjoy fellowship time. The Adult Choir always welcomes new members! Rehearsals take place on Thursday evenings, 7:00-9:00 pm, and on Sunday mornings at 8:45. If you are interested in joining this ensemble, please contact the Director of Music, Kristen Wedegis, at the church office at (860) 928-7449, or via e-mail at ewccmusic@yahoo.com. An ensemble of 11 ringers, the Handbell Choir rings the three-octave set of Malmark handbells during Sunday worship service 5-6 times per season. *Supporting the congregational hymns by playing special handbell arrangements. *Playing handbell parts for special choral Introits, Anthems, and Benedictions. *Ringing special pieces as a separate musical ensemble. * to promote the use of music to enrich Christian Worship. * to provide practical means of achieving the highest possible performance standards in worship. The most important aspect of The Royal School of Church Music Chorister Training Program is its ability to organize the training of singers from elementary school age through adulthood. The Chorister Training Programâ€™s goal is to increase motivation so that skills may be learned and personal qualities developed with enjoyment. This Training Program is not about learning rudiments or making the grade. It is about making music with confidence and expertise. It enables the individual singer to develop within the choral group, gaining skills, confidence and self-awareness as a singer, musician and a member of a group. It goes beyond vocal, choral and musical training, to show how the choir can be a more effective part of the church. The main feature of the program is the Individual Proficiency Levels. The program is divided into levels. The first level begins with basic concepts. The following levels build on the skills learned in the prior level of achievement. Choristers that successfully complete all the requirements of their level are awarded medals with a corresponding ribbon that is worn with their robes. RSCM also provides an optional parallel system of awards designed to be assessed through formal examinations: these are called the Bronze, Silver and Gold awards. Successful candidates are entitled to wear a prestigious medal cast in the appropriately colored metal (bronze, silver or gold), and these are worn on distinctive ribbons. 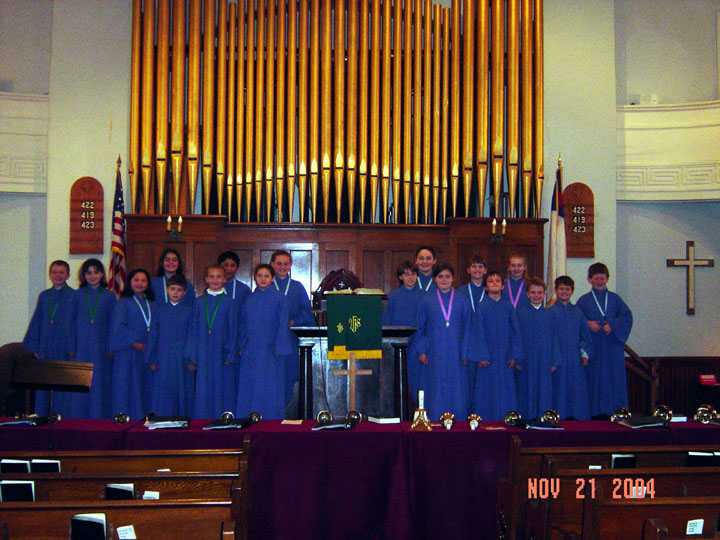 The East Woodstock Choristers were founded in 2000 and are considered an integral part of the music program. The choristers, all aged 7-15, sing alone and with the Adult Choir and Sunday School Choir throughout the program year (September-June). Rehearsals take place Friday afternoons from 3:30-5:30 pm. In addition to their service schedule, the choristers also have the opportunity to participate in regional choir festivals and summer programs of The Royal School of Church Music in America (RSCM). Admission to the East Woodstock Choristers is by a Parent/ Chorister Interview and is open to children in Grades 3 â€“ up with unchanged treble voices (soprano and alto). Interviews may be scheduled throughout the year. Those interested in scheduling an interview should contact the Director of Music, Kristen Wedegis, at the church office at (860) 928-7449, or via e-mail at econgregtnl@snet.net. The children in Sunday School may take part in the Sunday School Choir. Under the direction of Lynn Looby, the children meet weekly during Sunday School to learn familiar and new bible songs. The children present their songs during the program year (September-June). Instrumentalists contribute to the feeling of joy and contemplation during Sunday services. Instrumentalists may play pieces as a prelude, anthem, offertory and postlude in a chamber ensemble or as a soloist. The Music Ministry welcomes all instrumentalists who wish to share their gift. Those interested in playing should contact the Director of Music, Kristen Wedegis, at the church office at (860) 928-7449, or via e-mail at econgregtnl@snet.net. Kristen Wedegis is establishing herself as a choirmaster and teacher in Northeast Connecticut, having worked in several churches with singers from elementary school through adults, conducting pieces from the sixteenth century to present day. Ms. Wedegis has been the Director of Music at The East Woodstock Congregational Church since 1999. Upon this appointment, her primary duty was to develop the Adult Choir. During her time at East Woodstock, the Music Ministry has grown to include a Handbell Choir and full time Royal School of Church Music Chorister Training Program. In addition to her church duties, Ms. Wedegis teaches piano for the University of Hartfordâ€™s Community Division. She also has a growing private studio of piano and voice students. Ms. Wedegis received her Bachelor of Arts in Music in Organ from the University of Connecticut. She has also pursued Graduate Studies at The Hartt School. Ms. Wedegis is currently studying organ with John Rose and piano with Amy Champagne-Pott. Ms. Wedegis is an active member of the American Guild of English Handbell Ringers, The American Guild of Organists, Choristers Guild and The Royal School of Church Music in America.